While the public focus has been on the newest Goodyear blimp, Wingfoot One, preparations were being made to restore airship history from more than 80 years ago. 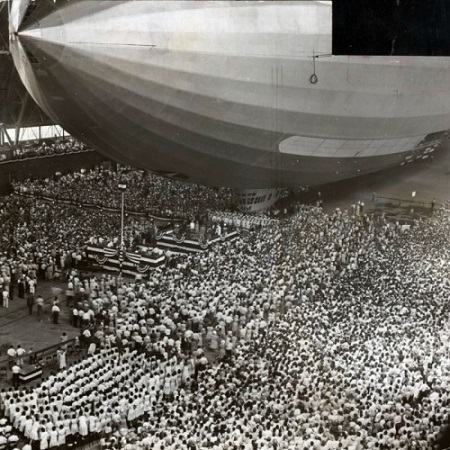 The University of Akron Archival Services has received a $13,440 grant from the National Film Preservation Foundation to save about eight hours of footage of the 1930s blimp USS Akron. The footage is on volatile nitrate-based film stock, which the movie industry abandoned in 1951 because of its flammability. The notorious Cleveland Clinic fire of 1929, in which more than 120 people died, was caused by nitrate-based X-ray film that was not being handled properly. The USS Navy Air Cruiser Akron flies over lower Manhattan’s financial district in New York City in this Nov. 2. 1931 photo. The Akron went down in a violent storm off the New Jersey coast. The disaster claimed 73 lives, more than twice as many as the crash of the Hindenburg, four years later. The USS Akron, a 785-foot dirigible, was in its third year of flight when a violent storm sent it crashing tail-first into the Atlantic Ocean shortly after midnight on April 4, 1933. As The Oxford Companion To Film notes, nitrate stock “causes severe problems for film libraries and archives” because it can so easily catch fire, and it may decompose rapidly. When Goodyear donated some 3,000 film and tape works from 1898 to 2007 to the university, almost all was in safer form, said S. Victor Fleischer, head of archival services at UA. But about 100 films were on nitrate. Those films could not be kept safely in Akron and were instead sent to a California company specializing in nitrate storage. But there is still the risk of decay, and some of the nitrates “had degraded to the point where they couldn’t be saved,” Fleischer said. The christening of the U.S.S. Akron in 1931 attracted thousands of people to the recently constructed Airdock. 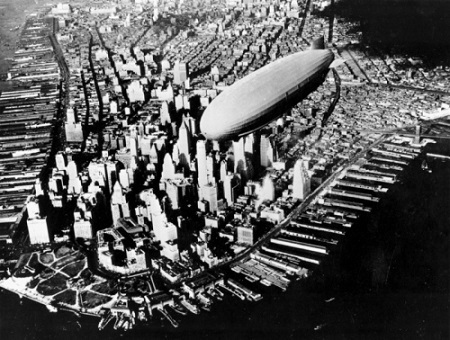 The four films about the blimp Akron were considered especially important historically. The second airship to bear the city’s name, the Akron made its maiden flight in 1931 and was the largest airship built up to that time. A Navy vessel, it was meant to work like an airborne aircraft carrier, both launching and recovering small airplanes, the Beacon Journal reported. It was 785 feet long — three times as big as Wingfoot One — with a maximum speed of 84 mph. But it was plagued by bad luck, the Beacon Journal said. The Associated Press later observed that the Akron was involved in three accidents before its final disaster. In 1933, it crashed into the sea during a storm off the New Jersey coast; lacking life vests and with only one raft, almost all of its 76 crew members perished. 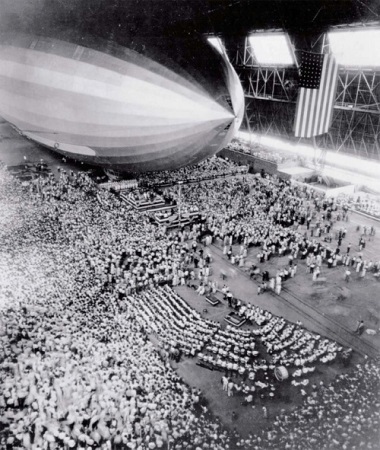 Thousands of people attend the christening of the Navy airship the USS Akron at the Goodyear-Zeppelin Corp. Airdock on August 8, 1931. 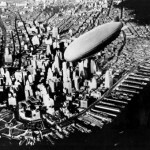 So there are reasons far beyond the blimp’s name to want to save its recorded visual history. The footage that is being restored includes the Akron’s construction, christening, test trials, maiden flight and operations. Fleischer said the film is in good condition, and the transfer to safe film stock will take about six months. It will then join other film in the archives which is available for public viewing on site, though not for outside circulation. There will not be a digital copy at first, Fleischer said, since the grant does not provide funding for digital; still, the archives should be able to make one after they get the film transfer. Of course, that leaves many other Goodyear films in the archive to be preserved. But the cost of doing so could run into the hundreds of thousands of dollars, Fleischer said. This entry was posted in Airships, History, News and tagged airship, National Film Preservation Foundation, nitrate-based film, U Akron Archival Services, University of Akron, USS Akron. Bookmark the permalink.